The Russian Navy is expected to receive over 40 upgraded anti-submarine warfare helicopters in the coming years. The Russian Navy is slated to receive ten Kamov Ka-27M anti-submarine warfare helicopters per year, the Russian Ministry of Defense (MoD) said in a statement on October 16. “This year, the number of Ka-27 helicopters arriving for naval aviation will make up another ten rotocraft. 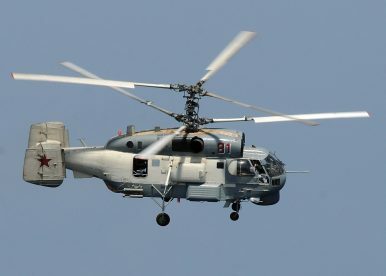 In compliance with the state armament program, the naval aviation is planned to be receiving 10 upgraded Ka-27M helicopters a year until the entire pool of these choppers is modernized,” the MoD said as quoted by TASS news agency. The Russian Navy received its first pre-production batch of eight upgraded Ka-27 helicopters in December 2016. The shipborne Ka-27M helicopter has been specifically designed for anti-submarine warfare missions and can be deployed aboard larger surface warships including aircraft carriers (e.g., Admiral Kuznetsov). It has been the mainstay of the Russian (Soviet) naval forces helicopter pool ever since first entering service in the 1980s. In June 2017, the Russian MoD approved the mass production of the upgraded Ka-27M at the Kumertau Aircraft Production Enterprise. The MoD plans to upgrade a total of 46 helicopters. The retrofitted helicopters will be fitted with a new tactical command system that includes new acoustics and a new phased array airborne radar, among other things. “The helicopters have received upgraded onboard radio-electronic equipment and a search system that allows using new systems of searching for and destroying submarines, and also radio-acoustic equipment that helps considerably improve the fulfillment of designated missions by this type of helicopters,” the MoD said. The helicopter can carry a payload of up to five tons and can be armed with a wide array of weapons systems including the KH-35 anti-ship missiles. “Nicknamed ‘Harpoonski’ [Kharpunskiy] due to its similarity to the U.S.-made Harpoon anti-ship missile, the Kh-35UE is a subsonic, sea-skimming anti-ship cruise missile armed with a 145 High Explosive (HE) fragmentation, penetration warhead,” I explained elsewhere. Modernization efforts in the Russian military have been affected by deep cuts in the defense budget. For example, the budget for modernizing and refitting the flagship of the Russian Navy, the aircraft carrier Admiral Kuznetsov, will most likely be cut in half. A U.S. Navy submarine will participate in the Japan Maritime Self-Defense Force Submarine Competition this week.